Let’s use Cisco Valet wireless router to set up home wireless network easily! Remember when going wireless required technical expertise and hours of effort? Not anymore — Valet simplifies the process! 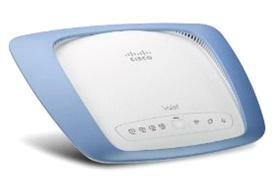 This Cisco Valet wireless router gives you the power to quickly and simply make your home wireless. The included Easy Setup Key gets you connected to the Internet in minutes. Cisco Connect software, pre-loaded on the Easy Setup Key, lets you quickly link your other wireless devices and manage your home wireless with ease. You can connect computers or devices to this wireless router by giving them Local access or Guest Access. Computer with Local access will have access to the Internet and to other devices on your local network (including shared computers and printers), whereas Guest Access allows you to provide guests visiting your home with Internet access only. - Enjoy the speed and range of Wireless-N. Check out here to learn more about this Cisco Valet wireless router! I had a very old Airport base station and was having trouble connecting my DirecTv wireless adapter to it. I figured it was time to upgrade. I did a lot of research online and was worried about not being able to set up a new router using my Mac. I bought this router with high hopes of a quick set up. I was not disappointed. I had 2 Macbooks, a Wii, my TiVo DVR and the DirecTv system all working within 15 minutes. So far signal is great throughout my three story home. The router is in the basement and my husband is on the third floor Skyping away. I highy recommend this for anyone that wants a quick and easy setup with little hassles! This is as close to plug and play as a wireless router gets. I was a little apprehensive about purchasing it because there are no product details outside the box. There is also no instruction manual inside but the USB key is prominently displayed. It simply instructs you to plug the USB key into the first computer. An onscreen guide walked me through the set up which consisted of plugging in a few cables. In less than five minutes the Cisco had set up a secure wireless network, a separate guest hotspot and sent me off to insert the USB key in any other computers I wished to connect to the network. This is the ideal device for the person who just wants their electronics to work and is not interested in details. It is possible to access the configuration screen from the Cisco software or via the IP address but you're paying for the convenience of never having to look under the hood. At the end of the process they reveal the name of your network and your password but there are no further instructions. I have not had a guest log on but I understand the process is similar to the login at a hotel. They actually have to open their internet browser and enter the password you provide on a welcome screen. A little more detail would have been nice. The Valet includes 24 hour live tech support which I consider a big plus. The router has various lighted symbols flashing but none of them are marked. I called to find out what they were and had live assistance in less than a minute. The woman was very pleasant but scolded me when I asked about what looks like a power button in the middle. It seems you could lose your set-up if you press the button. I have purchased many routers and this is by far the quickest and easiest to set up. The connection speed is also very good. The Cisco Valet is, indeed, easy to set-up; there's only one very significant problem with the wireless network that it sets up - degraded and unacceptable download and upload speed. After setting up my Cisco Valet wireless service with my main desktop PC and a laptop, I noticed that web pages were exceedingly slow. I undertook some speed tests and discovered that my desktop PC was 50% slower when connected to my wireless network as to when it was connected directly to my Comcast modem even after ensuring that my laptop was not connected to the network and was powered off. I called Cisco customer service and the technician advised me that the problem was the "safe surf" attribute of the Cisco valet. After the technician took direct control of my computer and reset my wireless network, he indicated to me that the problem was solved. I then took back control of my computer and ran a speed test. The readings were absolutely the same. When I told the technician that a 50% degredation in service was just not acceptable, he countered with a mantra that as long as I was able to connect with the internet, that's all that mattered. After my protestation that that was not all that mattered, he put me on hold to confer with his supervisor. He then repeated to me that as long as I was able to connect to the internet, that's all that mattered. I determined that any further discussion was futile, advised him that I would be returning the Cisco Valet to Amazon as an inferior product and that a failure to notify the customer that he/she could expect a 50% degredation in service was an unacceptable business practice. I wish to register a strong complaint about the abysmal level of customer service Cisco is providing for the Cisco Valet wireless router. I purchased such a device (Model No. M20, S/N CVK01K213675) through Amazon a few weeks ago and have had a terrible time trying to get it to work. I first spent several hours on my own, following the directions, trying to get the device to operate properly, without success. I gave up and called Cisco's Customer Service organization. I was assigned a Case Number. The first technician I spoke to did provide some early assistance but it was short-lived and I had to call again and this time got a different technician. She spent over an hour working with me without success and finally elevated my problem to a Cisco Advance Support Engineer. It was several days later before that Advance Support Engineer finally contacted me! She was indeed much more familiar with the product and was able to initially get me going. It seems there was some firmware missing on my device, it not having been installed by the factory! After working for just a short time, however, my device failed again and I called the Advance Support Engineer again. She did not return my calls. I then called a higher level Cisco manager whom I was told by one of the earlier reps was the Manager for such cases. This manager told me to just be patient and that I would eventually get good service from his Advance Support Engineer, but he made no other promise, commitment or offer to help. I haven't heard from that Advance Support Engineer since. I have never experienced such unreliable product service, especially when that product was known to be defective when shipped from the factory. I did not bargain for, nor expect, such atrocious service when I purchased a Cisco product. The appropriate positive motivation and attitude towards providing good customer service seems to be absent in many of the Cisco people to whom I spoked. Ironically, I am reluctant to criticize Cisco publicly since I am a long time shareholder - but such poor product support takes priority and needs to be corrected immediately - hence this comment. I had been using a 7 year old Linksys router that was impossible to lock. Not wanting to share my wireless connection with my neighbors I saw a review of the Cisco Valet and knew right away this was for me. The packaging is very impressive....reminds me of when I opened my iPhone box, but much bigger. Set up was a breeze, although I read conflicting instructions on how to do it. But I have a hunch it doesn't matter whether you insert the USB key first or connect the router to your modem before inserting the key. The Valet recognized my iPhone immediately and all I had to do was type my Valet password (supplied by the Valet) into my iPhone. Then I put the USB key into my wireless computer and that was a piece of cake. Took about 1 minute to connect to the router. I guess each router gets its own fancy name....mine is "fancy dolphin", which I decided to keep. The setup does give you the option to change the name or password, but the instructions said something about having to reset the router manually. And I think you would have to update the USB key if you make changes. I decided not to change anything. My only issue was trying to register the product with Cisco. On the registration screen it asks for a user name and password. Since I did not have either, it took several tries before I figured it out. You need to go the the Cisco homepage and register a username and password and then come back to the registration page. One other issue was trying to figure out what the center button does. Our of curiosity I pressed it and it started flashing. Not knowing what was going on I unplugged the power and then back in and it reset it self to normal. Instruction are all there on the Cisco web site...just in different places. The router is sleek and easy on the eyes.